As we are making our way through day three of the trip, I’m taking a little time to recount day two. 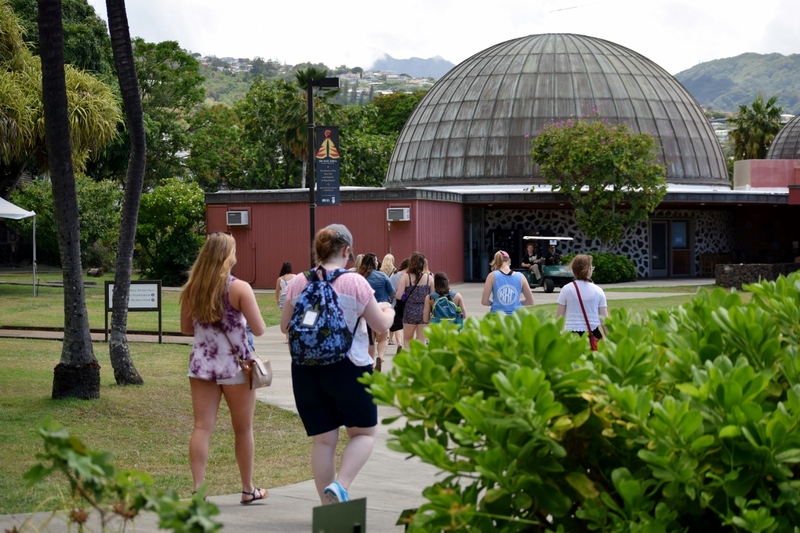 We started with a group trip to the Bishop Museum, the Hawaiʻi State Museum of Natural and Cultural History. We were first treated to a docent tour about Hawaii’s native birds and the museum’s newest exhibit, on loan from the The National Museum of New Zealand Te Papa Tongarewa for 10 years. 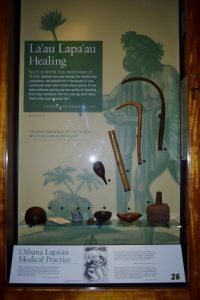 The ‘ahu ʻula (feathered cloak) and mahiole (feathered helmet) were a gift to Captain Cook from Chief Kalani‘ōpu‘u on Cook’s arrival to the island of Hawai’i (now commonly referred to as the “Big Island”) in 1779. The yellow feathers used to create the cloak and helmet came from the mamo bird, which became extinct in 1898. 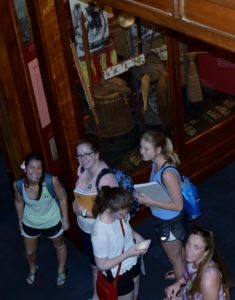 Students then explored the museum to find information about Native Hawaiian culture, as well as other Polynesian cultures, that affected health status, health care practices, and health communication. We met as a group to discuss our thoughts and observations before heading off to new adventures. Students also had time to see a special exhibit about sugar and candy, as well as the science museum. 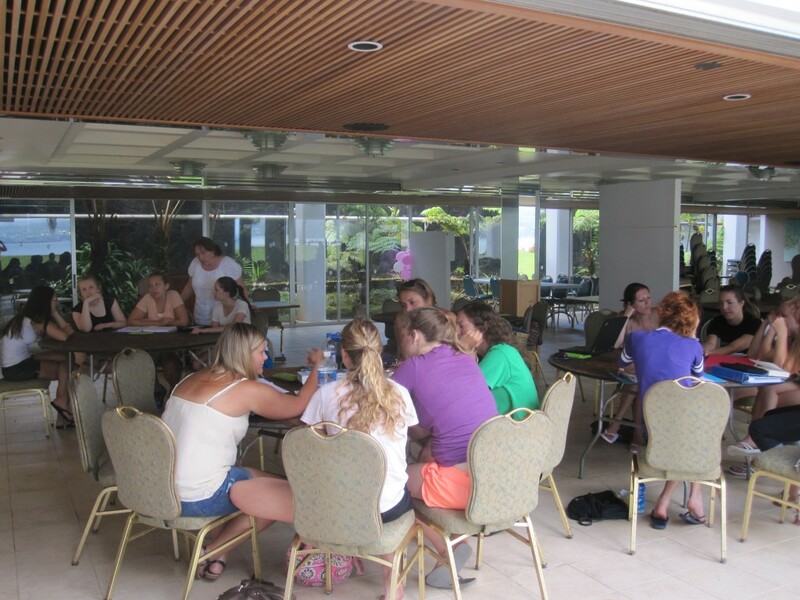 In the evening, we had a group welcome dinner at Duke’s Hula Grill on Waikiki Beach. Wonderful food, great conversations, and a spectacular view (none of which I have pictures of at the moment), but I’ll post them later–I promise! In response to student requests to try and create some additional free time before our return home, we flexed the plan for our schedule so that our final “class” was held in two parts; Monday evening from 7:00 – 9:00 pm, and then Tuesday morning from 9:00 – 11:00 am. During each session, three pairs of students gave their presentations on the alternative or complementary healthcare modality they investigated for the course. 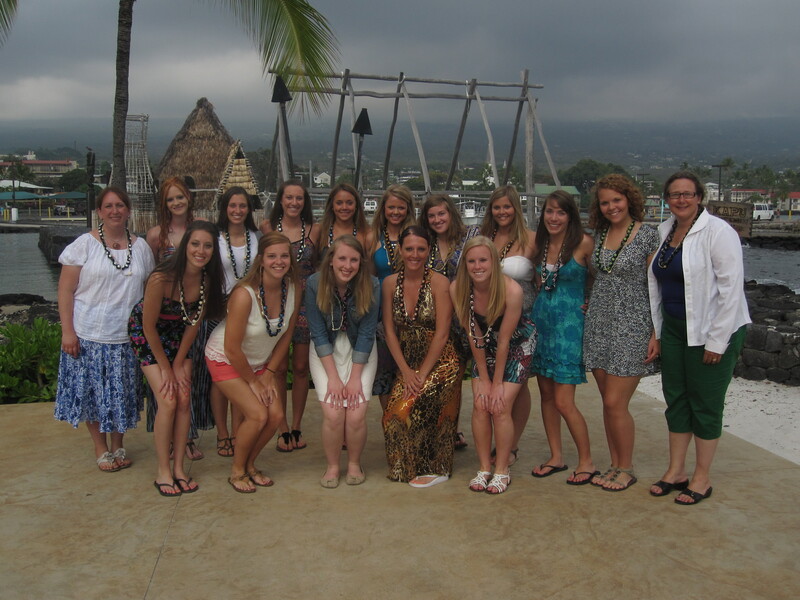 We gathered in a circle, and presented each student with a Kikui nut lei. In Hawai’i, the Kukui Nut tree is also known as the Candlenut tree. Kikui nut oil has many cooking and medicinal uses, and in ancient times, the nuts were burned to provide light. 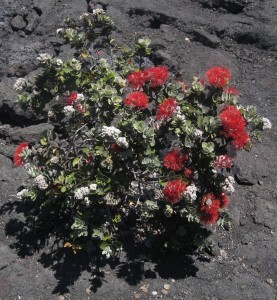 The meaning of kukui is a symbol of enlightenment, protection and peace. 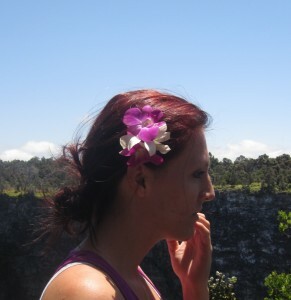 When you present a kukui nut lei to someone, you express this meaning to them – and now, these lei are often presented at the end of a course of study, or graduation. 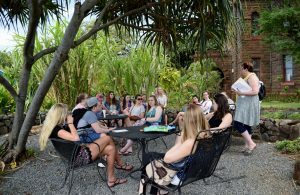 I love to travel, meet new people and learn about the intricacies of belief and cultural practice that influence interaction and decision-making. It has been an honor, and a great joy to lead this course, and have the opportunity to get to know these exceptional young women as we’ve completed this journey together. 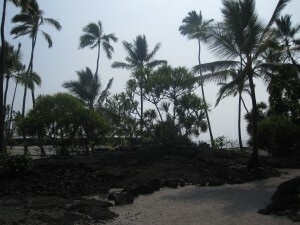 Like the royal grounds (pictured above), the beach canoe landing was only for the chief, and his attendants; a wooden image in the water warned others of the kapu. 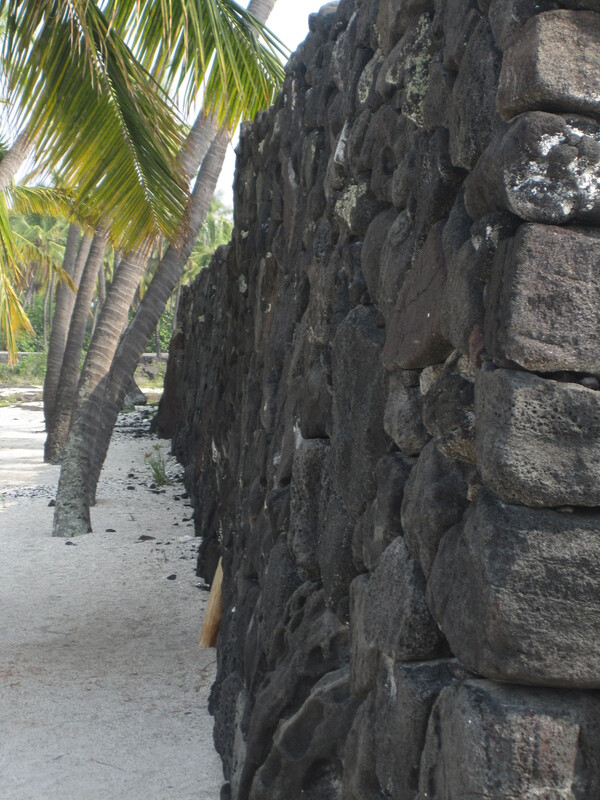 A massive stone wall, built around 1550 separates the royal grounds (home of the ali’i of the Kona district on the island of Hawai’i), from the pu’uhonua; a place of refuge for defeated warriors, noncombatants in time of war, and those who violated kapu, the sacred laws. 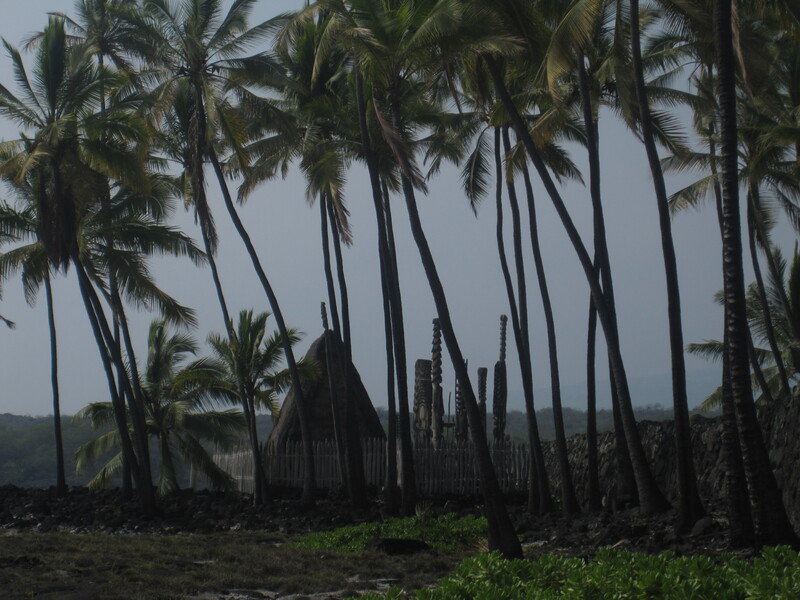 Beyond the Great Wall, on the ocean side, was a place that, if one could reach it, was open to all… The pu’uhonua is an area of sanctity in which blood could not be shed. 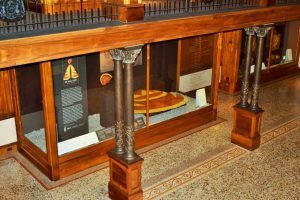 The sanctity was bestowed on the area because the bones of Keawe’ikekahiali’ iokamoku (great-grandfather of Kamehameha I), were placed in the temple there. Kapu regulated everyday activities. Women could not eat food reserved as offerings to the gods. They could not prepare meals for men, or eat with them. Seasons for fishing, killing animals, and gathering timber were strictly controlled. 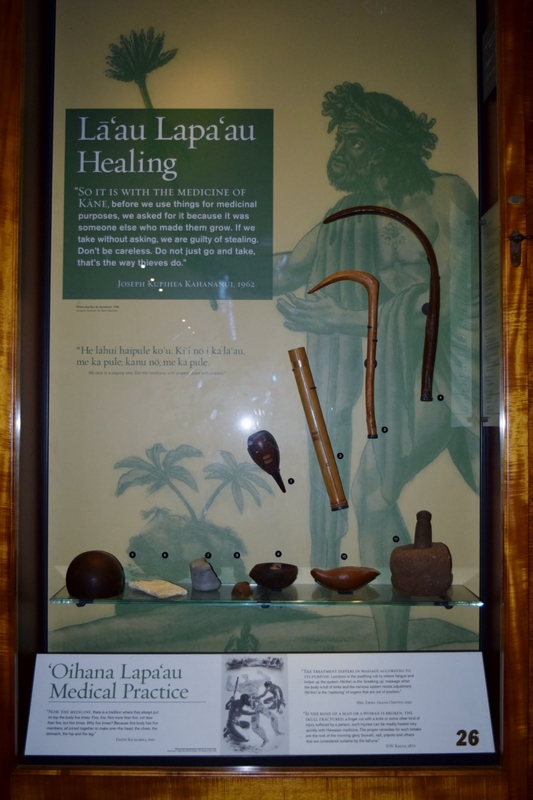 If a kapu was broken, the penalty could mean death. 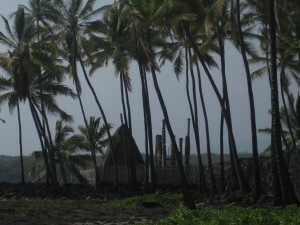 Otherwise, the gods might react with violence: volcanic eruptions, tidal waves, famine or earthquakes… To protect themselves from catastrophes, the people chased kapu breakers until they were caught – or until they made it to a pu’uhonua. 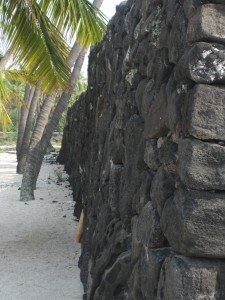 If they reached one of these sacred places, the kahuna pule (priest) performed a ceremony of absolution, and the offenders could return home safely. 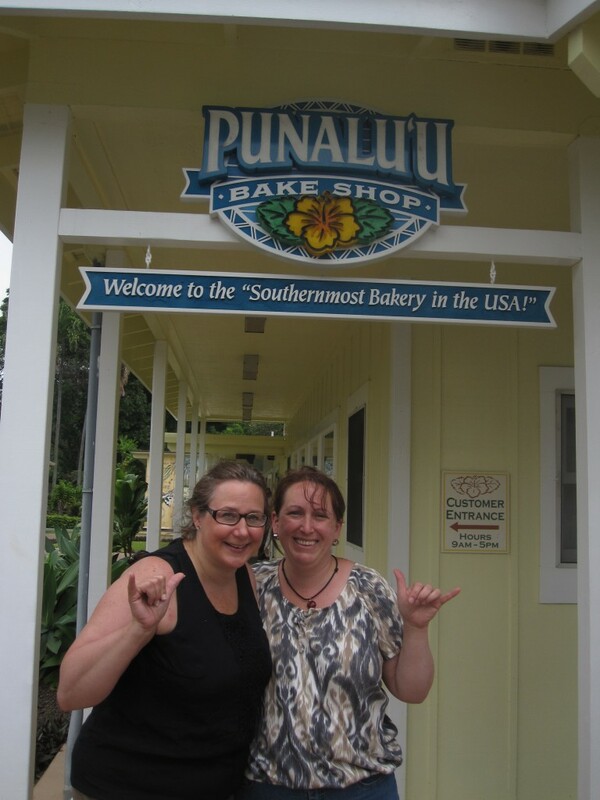 This bakery is located blocks away from South Point; a National Historic District Landmark area and the area that is renowned as the southernmost point in the United States (and the likely place where the first Polynesians reached the Hawaiian Islands). The last stop before lunch was the Black Sand Beach… the sand is very soft, and a rich carbon color. Sarah W., Jillian C., Kristen C. & Allison H.
and many nooks and crannies for these wonderful creatures to grab a quick meal of seaweed, and crabs! 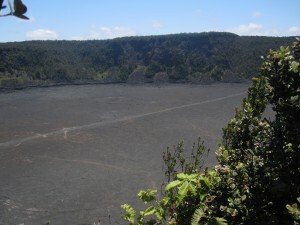 We made several stops at Hawai’i Volcanoes National Park, the first was at the active crater. 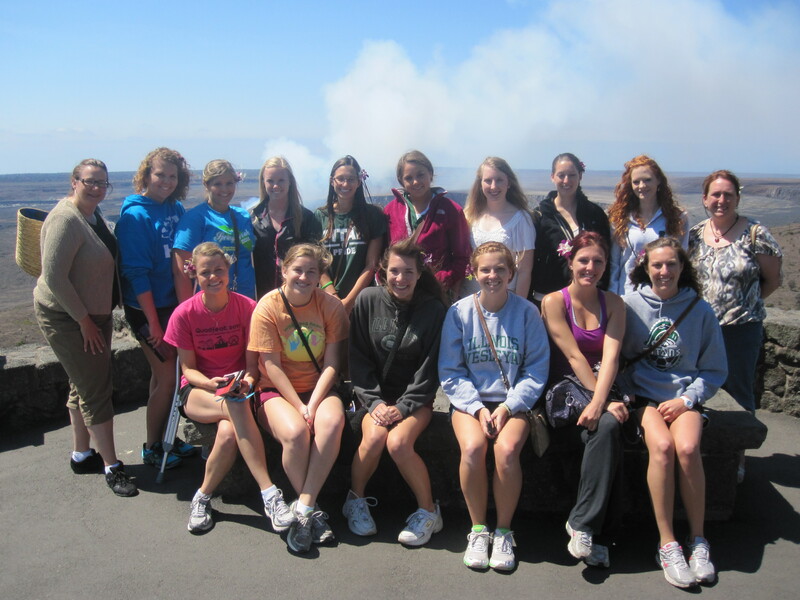 Our first stop was at the new Halema’uma’u Vent. The smoke plume behind the group comes from this vent. 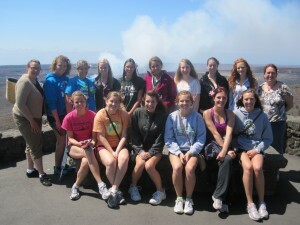 We also visited the Kilauea Iki Crater. This was amazing as we could see people walking the trail through the crater. They were very tiny from our vantage point. 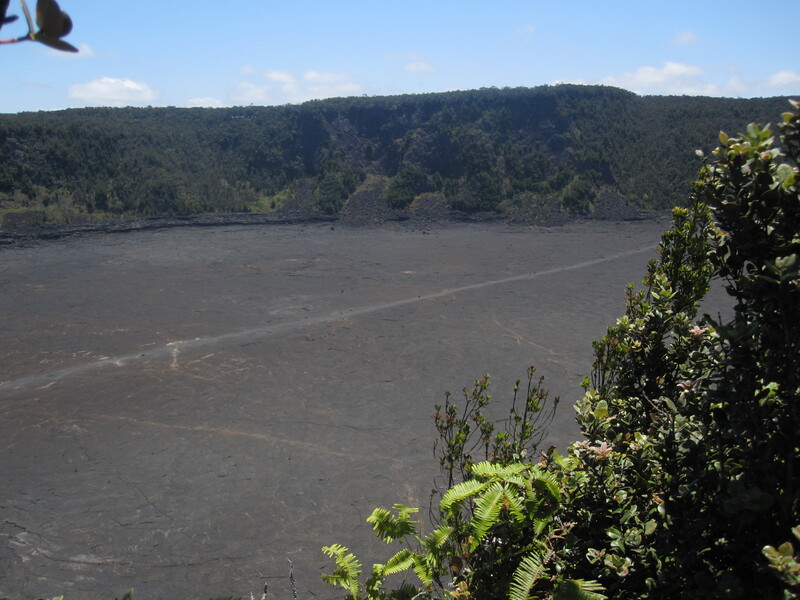 Kilauea Iki, a collapsed crater, has a hiking trail through the middle. From the overlook, the hikers looked to be the size of ants. The Thurston Lava Tube is named after a local haole, Lorrin Thurston (also the newspaper publisher and a leader in the overthrow of the Hawaiian monarchy). Mr. Thurston discovered the tube in 1913, and it is over 400 years old. 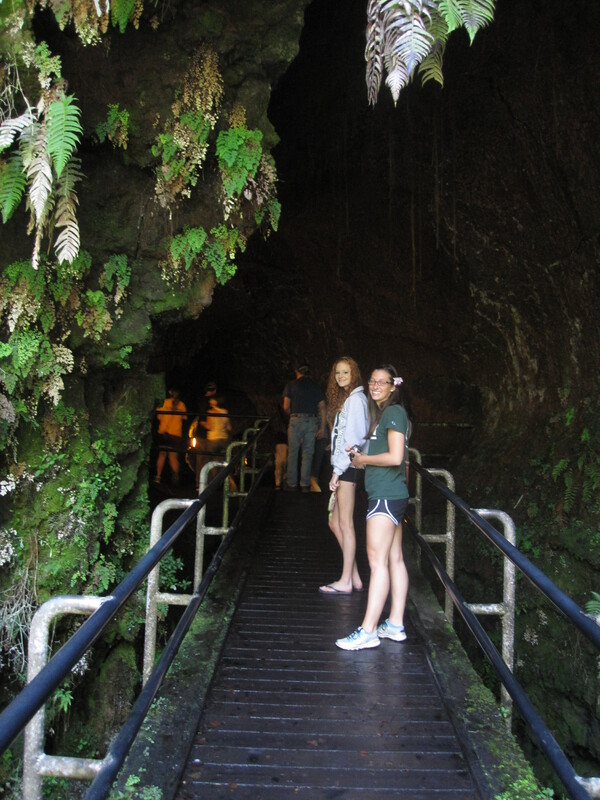 Lava tubes are channels created during lava flow, that then serve as conduits for additional lava. Kristen C. and Tara C. enter the tube. Another stop was at a deep crater, Puhimau. There was a short walk from the road to the overlook, with the trees suddenly opening to reveal the massive rock wall on the other side. It was a dramatic sight, and many gasps were heard. This crater creates an echo, and a few students tried it out. 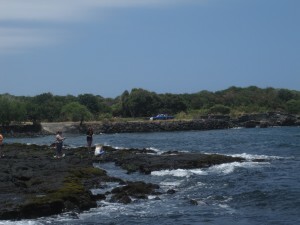 One other stop was a lava flow field from the 1980s. It was amazing to see plants growing in the lava. We walked very carefully across the field as there were many slanted services and sharp edges. Lehua flowers growing in the lava field.The lava field. 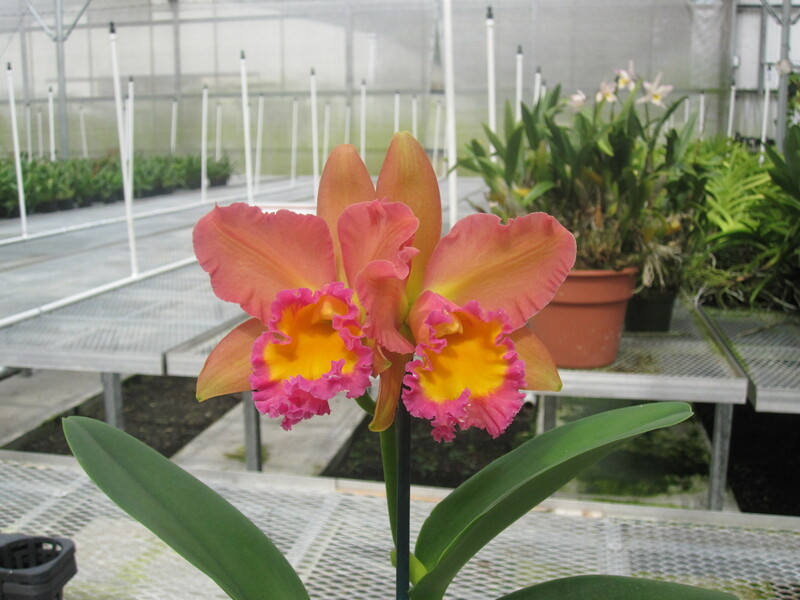 We didn’t take any pictures at the Macadamia Nut Farm so our “peeks” start with orchids. 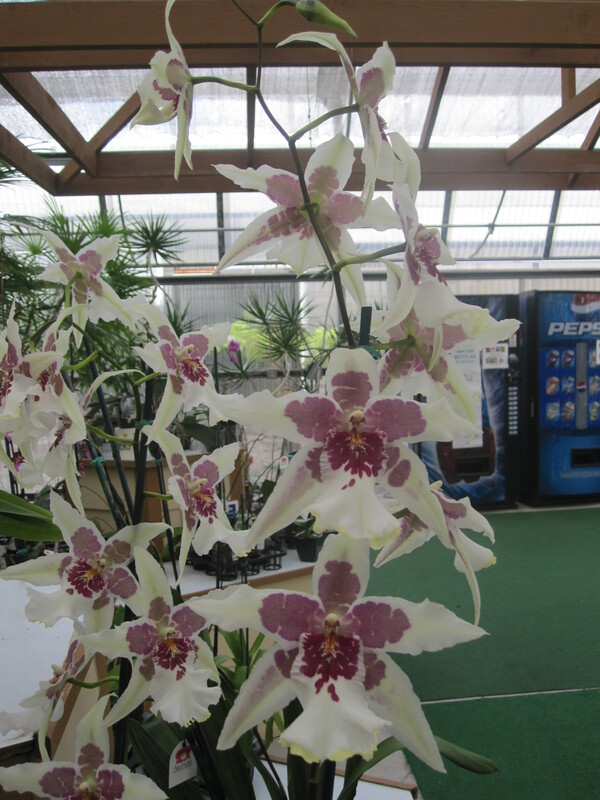 We were greeted at the entrance to the orchid show room with a basket of individual orchids and an invitation to take as many as we wanted, attach them to a bobby pin, and wear them in our hair. Right side = available, Left side = taken (jokes were that if it was in the back you were “looking to take someone home” and if you wore flowers on both sides you were “married, but still looking.”). 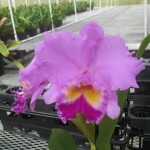 Hattie R. (a little later in the day) with her purple and white mix. 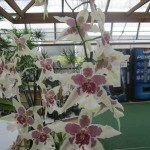 Many of us took many pictures of the many kinds of orchids in the show room. 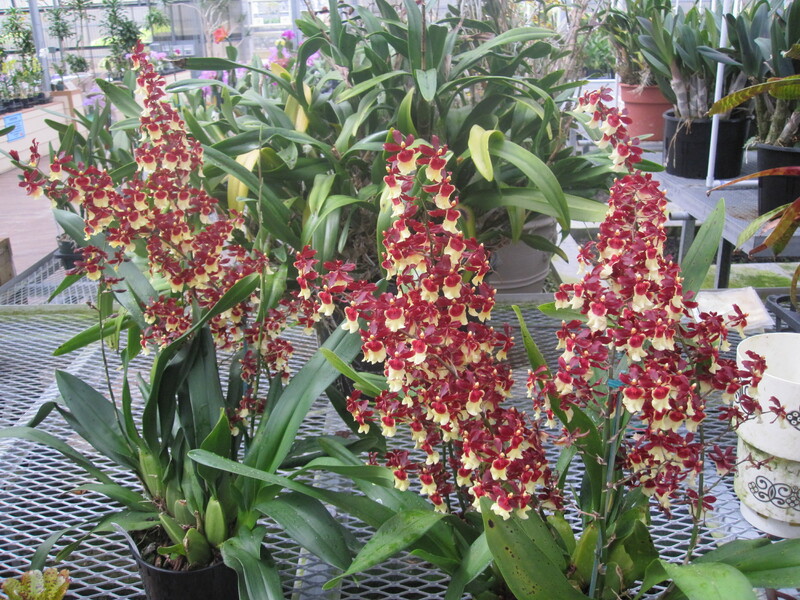 I never knew that orchids came in so many shapes and sizes. was choc-full of sites and experiences. 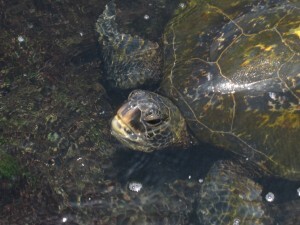 On Monday, May 21st (Day 20 of the trip BTW), we checked out of the Naniloa early in the morning, and boarded a full-size Roberts tour bus; a much smoother, and quieter ride than the vans we have traveled in so far. In the next few posts we’ll give you a peek at some of the wonderful things the group did and saw… But for now, we’ll write about a few of the day’s highlights. 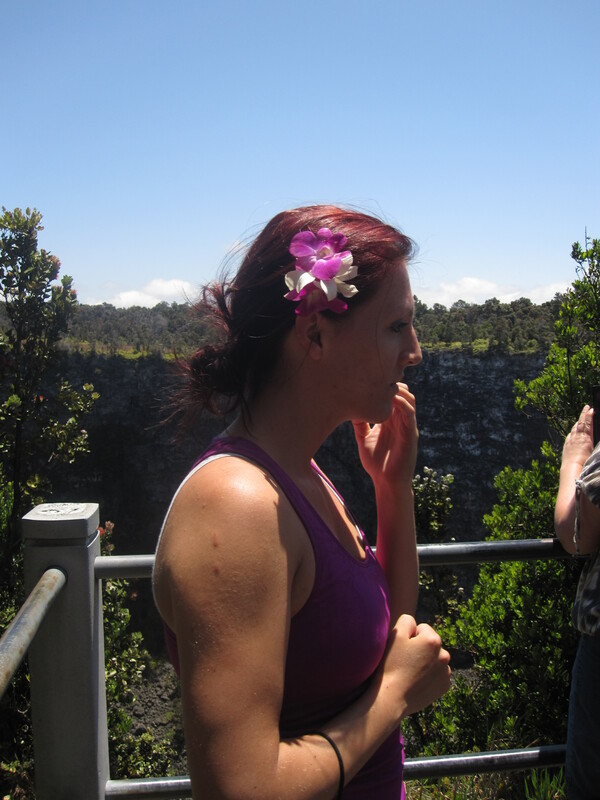 First stop was the Mauna Loa Macadamia Nut Farm. The processing facility was closed down for maintenance, so this was a shopping stop. We “think” that most students will refrain from eating all the product they purchased, so you MAY get to sample some of these treats when your daughter gets home! (This morning, Tara C. was observed eating her improvement on Reeses PB cups… Chocolate-covered macadamia nuts dipped directly into a Skippy jar…!). 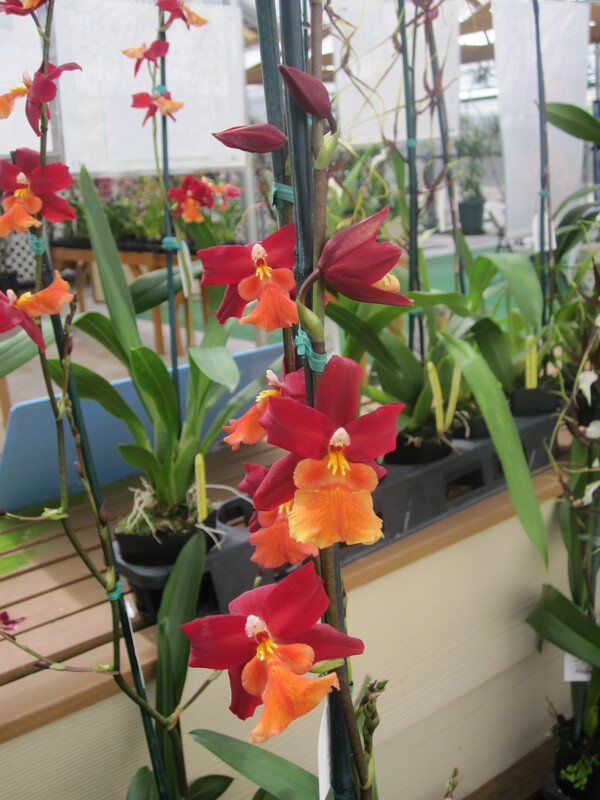 Next, we pulled into the Akatsuka Orchid Farm. 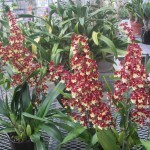 This business is run by a Japanese family that raises a phethora of types of orchids, and will ship anywhere in the world. 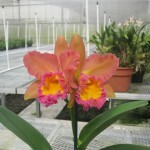 They even grow varieties that smell like chocolate, and coconut. 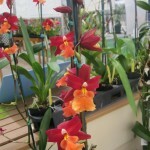 An FYI for my husband, Stephen… I found out that “Cattelya” (pronounced KAT-lee-ya) is the name of a variety of orchid… so, the next time you are at the restaurant at the Grand Palace in Tokyo, look to see if they have orchids as decorations (!). After 45-minutes or so in the bus, and we entered the Hawaii Volcanoes National Park. 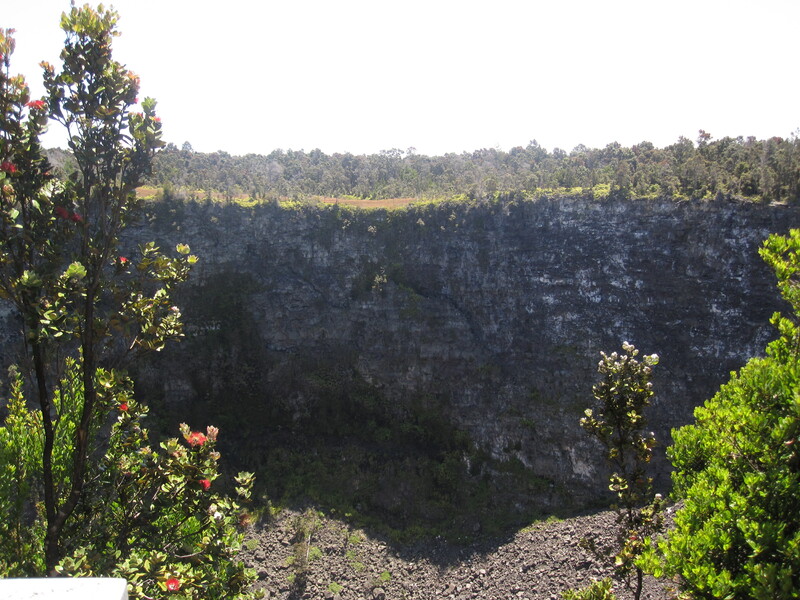 For the next several hours, we got and off the bus to see the Jaggar Museum and view the Kilauea crater/caldera, the steam vents, the Thurston Lava Tube, walk on a lava flow from the early 1980’s, and view two, older, dormant craters… AMAZING! Nest stop was the Black Sand beach, and another opportunity to see green sea turtles, both in the water and on land. 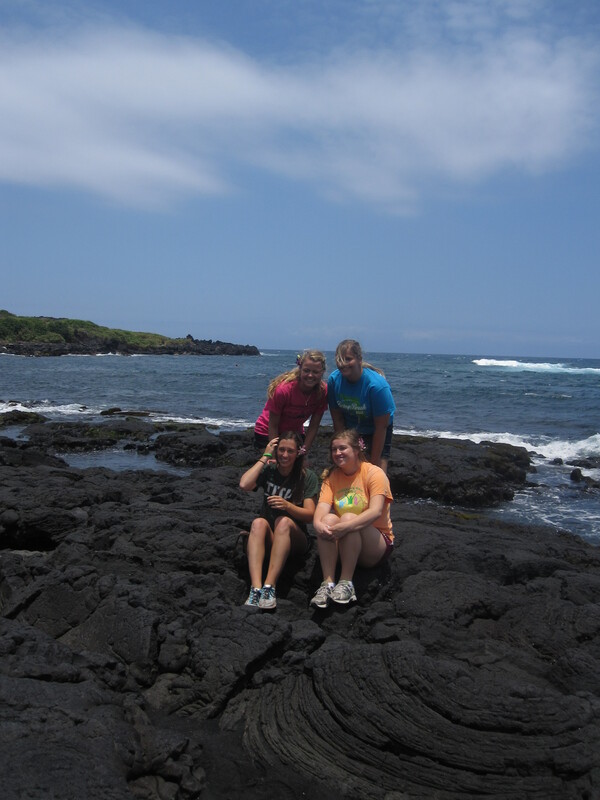 After this, we drove for another 30-minutes or so to stop for lunch at the Punalu’u Bakery. Another 45-minutes of winding roads, increasing elevation, and then a descent, brought us to Pu’ uhononua o Honaunau National Historical Park (City of Refuge); our last stop of the day before going on to the city of Kona, and our last hotel of the trip, the Courtyard King Kamehameha Kona Beach Hotel. We are off to the Luau!! We had a 3-hour class this morning. I led a discussion on the program of research of a colleague of mine from the University of Nevada, Reno / Orvis School of Nursing. 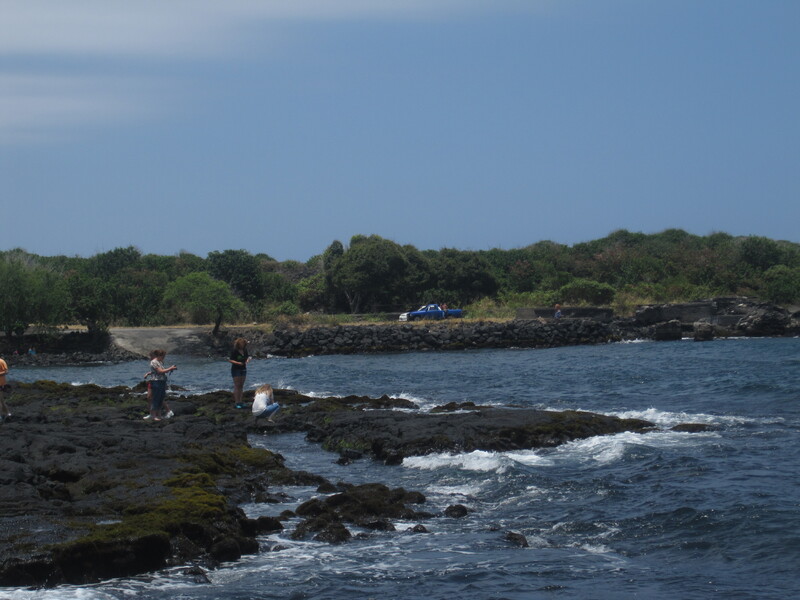 Dr. Bernadette Longo is a nurse epidemiologist who studies the cardiovascular and respiratory health effects of living in areas close to active volcanoes. 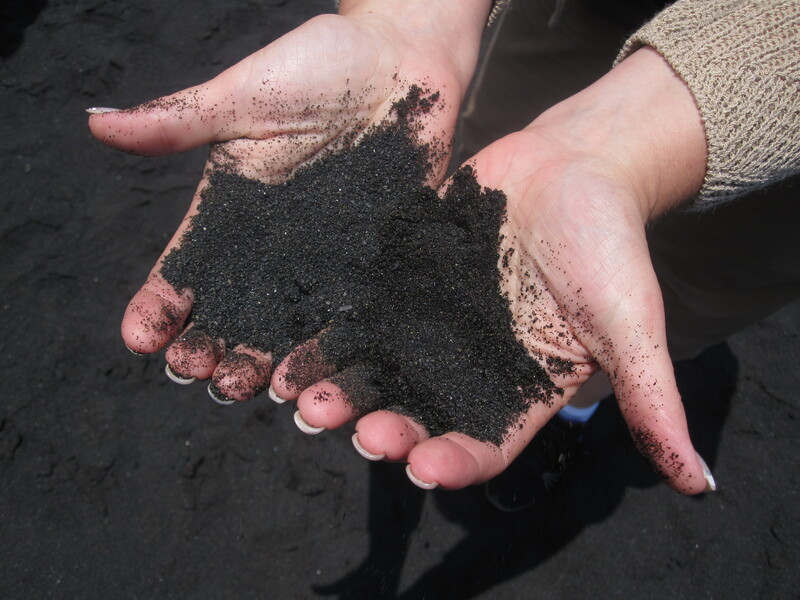 She has visited volcanic sites in all of the Americas, and has collected data related to the Kilauea volcano for several years. Kumu Lisa then led a discussion on current public health issues and legislation in Hawaii. The session ended with a review of the “This is Public Health” photos submitted by the students. In the afternoon, we had an informal discussion with David Gaynes, the man who arranged for Kumu Ehulani to teach us Hula on Saturday. 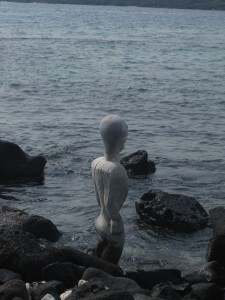 He moved to Hawai’i six years ago from the mainland, and felt an instant affinity with Native Hawaiian culture. He is a software developer, who works from home. He has also started a business to connect Native Hawaiians with visitors seeking cultural experiences on the Big Island. He invited a friend of his, a Kahuna in ancient Hawaiian chant, to come and provide a demonstration of the art for the students. 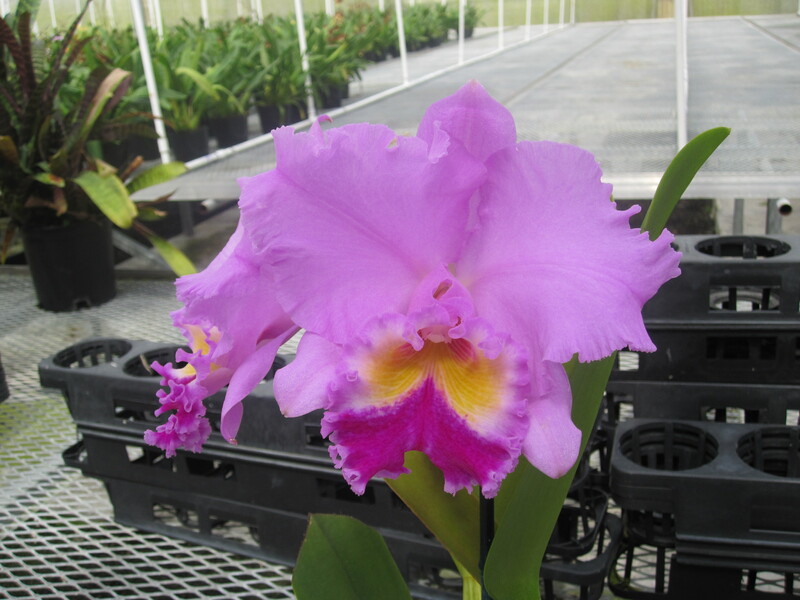 For the Kahuna, chant is an intense, and personal expression. 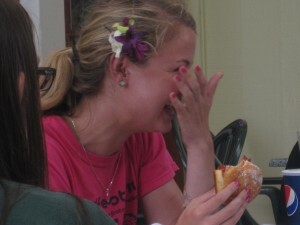 To show respect, we did not take any pictures while he was chanting.